Sketch Map of the Bustar Dependency. 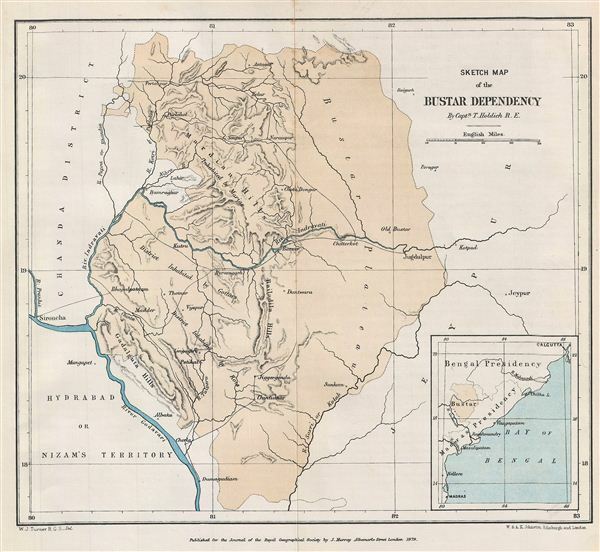 This is a fine example of the 1879 Stanford Map of the Bustar Dependency (Bastar State) in central India. Centered on the Indravati River, the map covers from Chanda District in Hyderabad to the Jeypur estate (Jeypore) in Orissa. Inset map of the region is included in the lower right quadrant. Various rivers, towns, cities and other topographical features are identified. Relief is shown by hachure. Notes the regions inhabited by regional tribes, including the Marias and Gottars. This map was drawn by A. K. Johnston and published by e. Stanford with contributions by Capt. T. Holdich, R.e., as part of the Proceedings of the Royal Geographical Society and Monthly Record of Geography, Vol. I, in 1879.